Our current obsession with social media and mobile devices seems to have improved our connectivity with each other, but it is also changing it for the worse. Here are two innovative creative videos that remind us how social media can destroy, not build, relationships. Lee Ross’s creatively produced vignette brilliantly demonstrates the breakdown in human interaction; while Prince Ea intelligently raps about the problem, ironically pointing out what we’re missing. They both beg the question: Are we really living life, communicating and developing meaningful relationships? 1. 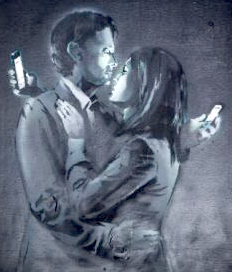 From a comedic perspective 4gLove by LEE ROSS is a funny but sadly true depiction of cellphone addiction destroying relationships. This 5-minute film is available on Vimeo and YouTube. 2. We are so consumed by our phones and social networks, we sometimes forget how to live. Prince Ea says the obvious in this video: Why I Refuse to Let Technology Control Me: You need not delete your social networks or destroy your cell phones, the message is simple, be balanced, be mindful, be present, be here. 🙂 If you like his message you can download the digital audio Can We Auto-Correct Humanity? Rick Hotton’s Holy Mole´ cartoon amusingly makes the same point. There are other videos out there on this topic. Here are two poems about the problem, Look Up by Gary Turk, and a counter argument, Look Down (‘Look Up’ Parody) by Spencer & Alex. Clever, both of them, with charming British accents. I cropped and titled the top image taken by British photographer Adam Gray. See the brilliant depiction of the grip of modern technology over our brains by British cartoonist and animator Steve Cutts in these cartoons: OWNED, and this unusual selfie: SENT FROM MY IBRAIN. This clever Instagram cartoon literally and visually nails the dilemma of people being prisoners of their cell phones. New Yorker cartoonist Alex Gregory on what social media is doing to us. Here is a brilliant solution to this problem I found two years after this posting: NoPhone Air: the Latest iPhone Aimed at Cellphone Addicts. Watch this brilliant TEDxUtrecht Talk Ben Langeveld & Ingmar Larsen gave: How a piece of plastic can change the world. Here’s another solution. Watch what happens when this person reaches for their phone: the dog stages an intervention. This cartoon shows another approach in dealing with the problem. 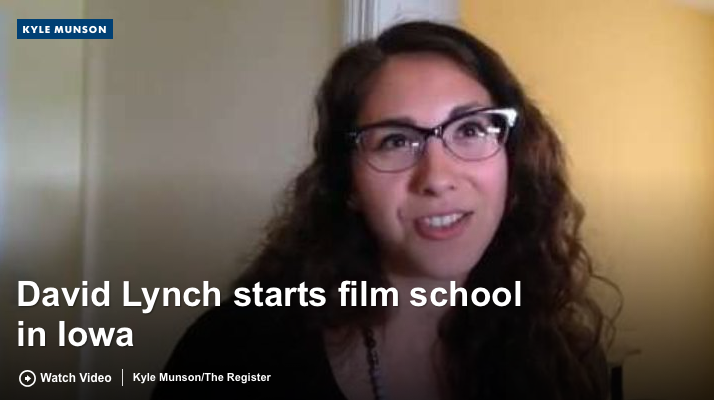 Des Moines Register’s Kyle Munson profiles the David Lynch MA in Film at Maharishi University of Management in Fairfield and Vedic City, Iowa. On Thursday, October 9, 2014, I hosted The Register’s Iowa journalist Kyle Munson and photographer Mary Willie. Kyle had contacted me during the week because of David Lynch’s announcement to produce 9 new episodes of Twin Peaks for Showtime. This seemed to be the tipping point to finally visit our Masters Program in Film in David Lynch’s name. For information on the David Lynch MA in Film at MUM, visit http://filmschool.mum.edu. Kyle said his report would appear this weekend. I checked online Saturday night to find Kyle’s video and Mary’s photos about MUM’s DLMA, both in an article: Vedic City film school program enters 2nd year. This is how it appears in the Sunday Register. The title may appear to be a bit confusing since the David Lynch MA in Film is part of Maharishi University of Management, based in Fairfield, Iowa. But the graduate film department classrooms and offices are located in Headley Hall in neighboring Maharishi Vedic City. As a result they’ve now retitled the article to read: Munson: David Lynch and the ‘Twin Peaks’ of Iowa. The article starts out referencing one of the most famous lines from David Lynch’s iconic TV series, Twin Peaks. Fairfield, Ia. – It’s easier to find a “damn fine cup of coffee” here than in other Iowa towns two or three times the size. Kyle interviews Joanna Plafsky, the one who created the program; John Raatz, the new executive director who also brought Jim Carrey to give this year’s commencement address; as well as some of the students who came from far and wide for the graduate film program, including the international scholarship winner, Agnes Baginska, whose film was selected by David Lynch himself. Agnes posted a scan of the full article on her website and her Facebook Timeline Photos. Read the rest of the article here. Click on these titles to see the video and photos. 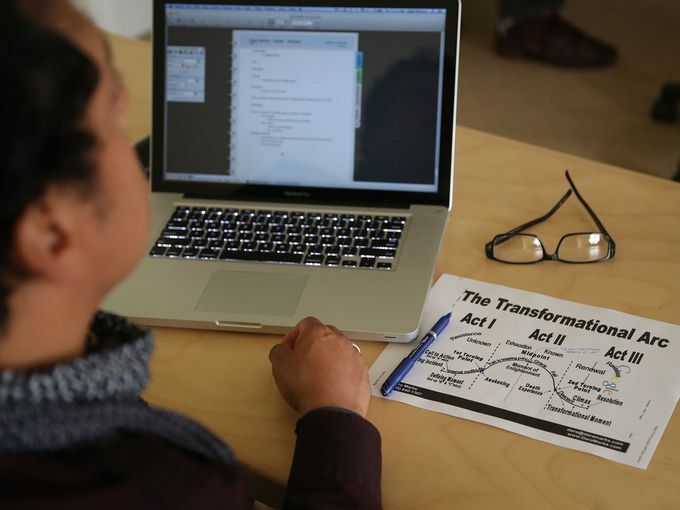 Related news: Fairfield Creatives Get Started. Months later some of our students participated in a music video for Kid Moxie singing the hauntingly beautiful “Mysteries of Love” written by David Lynch and composed by Angelo Badalamenti. The film premiered at The Music of David Lynch fundraiser. Noisey/VICE broke the news, launching the video with photos. Watch ‘Twin Peaks’ Composer Angelo Badalamenti’s Eerie Video for “Mysteries Of Love” with Kid Moxie. See a press release with the video and more production stills: David Lynch Music Tribute Continues with Online Music Video Premiere.